When you’ve made the changes you want to make, and you’re ready to submit those changes for publishing, click the “Save as Draft” button at the top right of your screen. Your changes will be saved. Once you’ve saved your changes as a draft, click “Submit for review.” Once you’ve done that, your changes will be reviewed by Web Services before we approve it and it’s published (or we send it back to you for further changes). 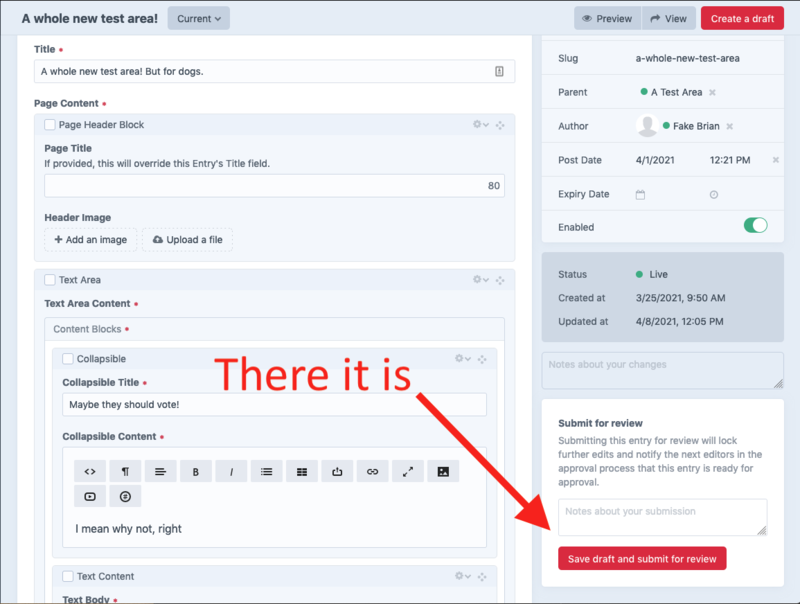 NOTE: If you realize you need to make more changes to a page you’ve already submitted, just click the “Revoke submission” button, which will appear where the Submit for approval button was previously. When will my edits publish? Web services approves and publishes changes twice a day: In the morning between 11 and noon, and in the afternoon between 4 and 5pm. If you have a lot of changes to make to a page, and you know you’ll be working on it for a while, it’s a good idea to save your work frequently. You’ll do this in the way we just discussed: by clicking Save as Draft. After you’ve saved your draft, you can periodically save your work and continue editing it by using the key command CTRL + S (command + S on a Mac). Or you can just click Save Draft; that will work too. When you save a page as a draft knowing you’ll be coming back to it later, it’s helpful to name it something specific so you’ll remember which changes you’ve made. You can do this by clicking the Pencil icon next to the name of the draft — it’s the pulldown menu up by where the page title is. 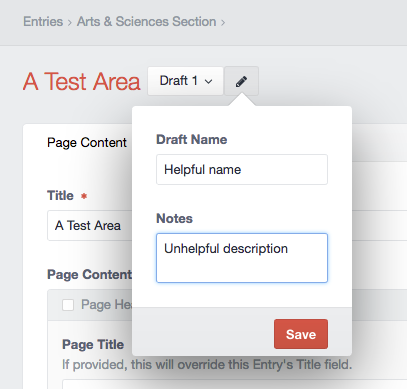 Put your draft name and descriptive text in the boxes, then click Save. 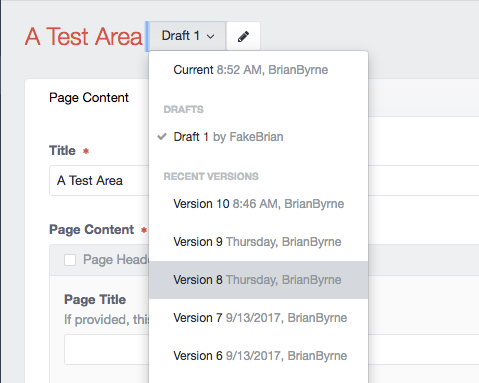 When you come back later to edit your draft, click the Version bar to show which versions of the page are available, including your recent drafts. If you’ve made changes to a page by mistake, you can revert to an earlier version of the page using the Version menu as well. When you’ve confirmed the version you want to revert to, email web services at webmaster@okcu.edu and let us know the name or number of the version you want to revert to — “Version 4 from 11/20/2016,” for example. That’s how you get your changes published to the live site!